Our guide to Colorado Springs will help you find the best budget hotels in Colorado Springs Colorado. With vast, rolling plains to the east and Pikes Peak towering at 14,000 feet to the west, Colorado Springs is enveloped in glory. Magnificent red sandstone pinnacles at the base of the mountain have been dubbed appropriately, "Garden of the Gods." The city itself — the second largest in Colorado — is adorned with beautiful Victorian homes and turn-of-the-century buildings. Once known as a Gold Town, Colorado Springs now boasts something for everyone, from the arts buff to the outdoorsman. Popular family attractions include Pikes Peak Ghost Town, Old Colorado City, and Manitou Springs. Gorgeous views of the Continental Divide can be seen from the Manitou & Pikes Peak Cog Railway. There are tons of great budget hotels in the city of Colorado Springs, our city guide will help you find the best budget hotels. You may have a hard time deciding what to do in Colorado Springs, but we make your decision easy. 1075 Kelly Johnson Blvd, (719) 260-6969 - Sleep Inn North Academy is a budget hotel / motel / resort located in Colorado Springs CO.
1410 Harrison Rd, (719) 579-6900 - Comfort Inn South is a budget hotel / motel / resort located in Colorado Springs CO.
1440 Harrison Rd, (719) 576-2371 - Best Western Executive Inn is a budget hotel / motel / resort located in Colorado Springs CO.
1570 N Newport Rd, (719) 637-0800 - SpringHill Suites Colorado Springs South is a budget hotel / motel / resort located in Colorado Springs CO.
1780 Aeroplaza Dr, (719) 574-7707 - Best Western Airport Inn is a budget hotel / motel / resort located in Colorado Springs CO.
1810 Briargate Pkwy, (719) 598-6866 - Hilton Garden Inn Colorado Springs is a budget hotel / motel / resort located in Colorado Springs CO.
2115 Aerotech Dr, (719) 579-6900 - Comfort Inn Colorado Springs is a budget hotel / motel / resort located in Colorado Springs CO.
2725 Geyser Dr, (719) 576-1717 - Fairfield Inn Colorado Springs South is a budget hotel / motel / resort located in Colorado Springs CO.
2765 Geyser Dr, (719) 576-0101 - Residence Inn Colorado Springs South is a budget hotel / motel / resort located in Colorado Springs CO.
2875 Zeppelin Rd, (719) 574-2701 - Homewood Suites Colorado Springs Airport is a budget hotel / motel / resort located in Colorado Springs CO.
3402 Sinton Rd, (719) 635-5486 - Budget Host-Pikespeak is a budget hotel / motel / resort located in Colorado Springs CO.
3880 N Academy Blvd, (719) 574-0370 - Residence Inn Colorado Springs Central is a budget hotel / motel / resort located in Colorado Springs CO.
555 Garden of the Gods Rd, (719) 593-9119 - Quality Inn & Suites Garden Of The Gods is a budget hotel / motel / resort located in Colorado Springs CO.
5855 Corporate Dr, (719) 266-4206 - Extended Stay America is a budget hotel / motel / resort located in Colorado Springs CO. There are plenty more budget hotels in Colorado Springs. 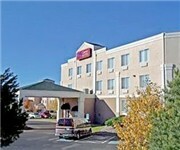 See all budget hotels in Colorado Springs Colorado.